Jane Wyman was a very popular actress during the 1940s and 50s. She starred in a number of important dramas of the time, earning a reputation for being a serious performer who could appear in a range of film styles. Her lasting legacy is that she was the first wife of Ronald Reagan. Born to working class parents who divorced when Jane was three years old, Jane's mother did not want to raise her daughter, so she found some foster parents in St. Joseph to do it. It was not a happy childhood, what with moving to Los Angeles for a time, then back to Missouri. Attending Lafayette High School in St. Joseph, she began working by singing at a local radio station, lying about her age to obtain the gig. Dropping out of high school, Jane returned to Tinseltown, working odd jobs until she got small parts in stuff like Gold Diggers of 1933 (which played the Chinese in June, 1933), King of Burlesque (played the Chinese in December, 1936), and My Man Godfrey (released in September, 1936). She had married and took the last name of Ernest Wyman in 1933; she divorced him in 1935. Wyman then was signed to a contract at Warner Bros., got married and divorced a second time, and co-starred with Ronald Reagan in Brother Rat (released in October, 1938), and its sequel, Brother Rat and a Baby (released in January, 1940). She and Reagan married that same year. Wyman clicked with audiences. Warners shoved her in the western Bad Men from Missouri (released in July, 1941), and You're in the Army Now (released in December, 1941), in which she had a very long (3minutes, 5 seconds) screen kiss with Regis Toomey. Where do you go after that? Director Billy Wilder barrowed her from Warner's to play a modern career girl involved with Ray Milland's lush in The Lost Weekend (released in November, 1945); Wyman got great notices for the film, and she followed it up with the classic children's film The Yearling (released in December, 1946). The dramatic and shadowy world of Johnny Belinda (released in September, 1948) won Wyman an Oscar for her portrayal of a rural deaf mute who goes through a harrowing experience. Now, Wyman was both a box-office champ and Oscar winner; she could call her own shots. After divorcing Ronald Reagan in 1949, director Alfred Hitchcock cast Wyman in Stage Fright (released in April,1950). She starred with Kirk Douglas in The Glass Menagerie (released in September, 1950). She did the Frank Capra comedy Here Comes the Groom (released in September, 1951), and The Story of Will Rogers (released in July, 1952). Grauman's Chinese Theatre, Hollywood, California. Jane Wyman Forecourt ceremony, Wednesday, September, 17, 1952. 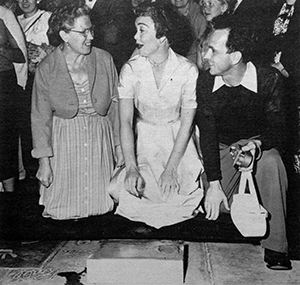 Contest winner Lena Evaristo, Jane Wyman and Larry Evaristo share a laugh over their prize — a small hunk of cement signed by Wyman. 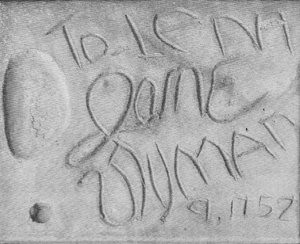 Jane Wyman's "contest prize" block. Unknown dimensions. Executed by Jean Klossner. 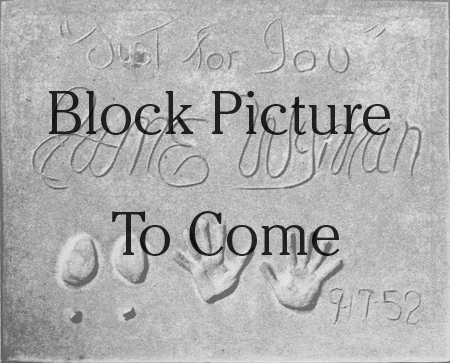 Wyman's first real musical, Just for You, reunited her with her Here Comes the Groom co-star Bing Crosby, had just opened at the Chinese the day of her Forecourt ceremony; a contest was held with the winner, Lena Evaristo, getting a small concrete block signed by Jane Wyman, and her one footprint. Wyman continued to star in a wide range of films. She starred in the remake of Edna Feber's So Big (released in October, 1953), co-starred with Rock Hudson in one of the most popular of the 1950s tearjerkers, Magnificent Obession, (released in August, 1954), and All That Heaven Allows (released in December, 1955), and starred with Van Johnson in Miracle in the Rain (released in April, 1956). 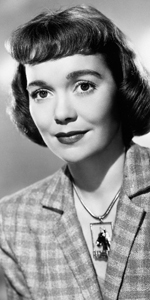 Wyman had her own anthology series on television, the Jane Wyman Presents the Fireside Theatre over NBC, from 1955 to 1958. She replaced an ill Gene Tierney in Holiday for Lovers (released in July, 1959). Wyman joined the ensemble cast of Walt Disney's version of Pollyanna (which played the Chinese in July, 1960), did another Disney movie, Bon Voyage! (released in May, 1962), and made her final film, How to Commit Marriage (released in July, 1969). Like many Hollywood actresses, Wyman guest starred on a lot of television shows: Wagon Train in 1962, My Three Sons in 1970, The Bold Ones in 1973, The Love Boat in 1980, and Charlie's Angels in 1980. Wyman had almost 10 years playing superbitch Angela Channing on the television show Falcon Crest on CBS, from 1981-1990. During the last few years of the show, Wyman had several major health problems, but kept doing the show until it was cancelled; her final effort was doing a guest star role on Dr. Quinn, Medicine Woman in 1993. Wyman retired to Rancho Mirage, California, where she died of natural causes in 2007. She was 90 years old. Grauman's Chinese Theatre, Hollywood, California. Jane Wyman Forecourt ceremony, Wednesday, September, 17, 1952. 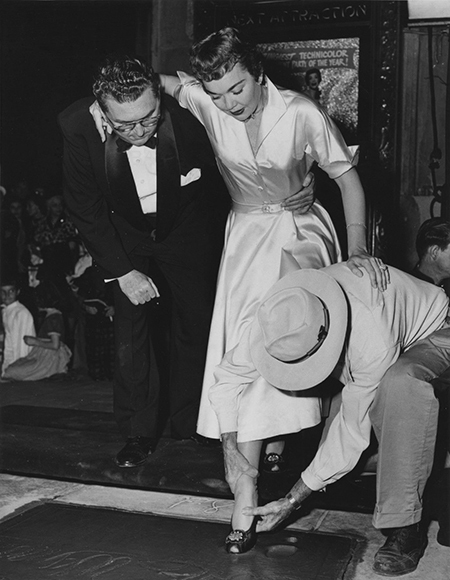 Chinese Theatre manager Ralph Hathaway assists Jane Wyman as cement artist Jean Klossner makes the imprint of Wyman's shoe.